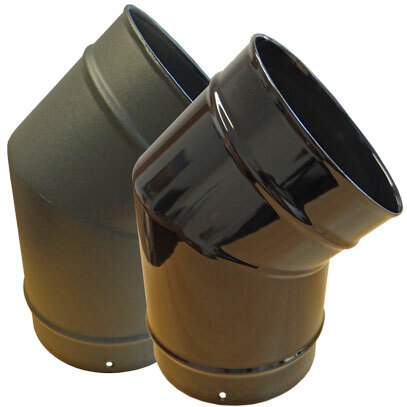 Vitrelux stove pipe is a single wall connecting stove pipe with a high temperature, acid resistant enamel coating. Manufactured from 1.0mm zero carbon steel from size 5 inch to 8 inch and 0.9mm in 4 inch only. Available in both matt black and gloss black finishes from 4 inch to 6 inch diameters, and in matt black finish from 7 inch to 8 inch diameter. Lengths and elbows are available with doors which allow for cleaning access and can be removed and refitted without chipping. 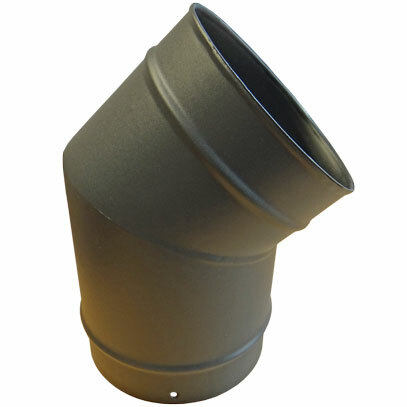 Vitrelux stove pipe is used to give a sleek and stylish finish to the internal visible section of a system.. Vitrelux stove pipe must only be used to connect an appliance into an existing chimney or appropriate flue system. Vitreous Enamelled Stove Pipe Vitrelux Black - 100mm (4 inch) diameter. Vitreous Enamelled Stove Pipe Vitrelux Black - 125mm (5 inch) diameter. Vitreous Enamelled Stove Pipe Vitrelux Black - 150mm (6 inch) diameter. Vitreous Enamelled Stove Pipe Vitrelux Black - 180mm (7 inch) diameter. Vitreous Enamelled Stove Pipe Vitrelux Black - 200mm (8 inch) diameter. UniVit Stove Pipe Matt Black - 125mm (5 inch) diameter. UniVit Stove Pipe Matt Black - 150mm (6 inch) diameter.